Why this festival? And why in Kaunas? The idea of ​​the festival was born from public debate that has taken place in Kaunas for several years: does Kaunas need a different theater and where would a place for such theater be? The festival seeks to present postdramatic theater, and to give audience the opportunity to get acquainted with the theater, which in a local context is yet conditionally new. The axis of the festival – site-specific, immersive theater development specifics. Festival organizer duo – Renata Bartusevičiūtė and Paulina Nešukaitytė. The second theatre festival HOUSE No. 2 will take place from 15th June, 2019 to 10th July, 2019 and will invite to return to school. The main focus will be towards the collective creative theater directions. The organizer’s choice of this space was inspired by the theme of the second year of the festival: the human change from a child to an adult, the faint boundary that separates these two groups, and all the guardians of this transformation – school/education – as a process that begins, but never ends. Therefore, ranging from creative workshops to day camps, from performances to theatrical experiments – the whole emotional cocktail that accompanies each of us, not just in our teen years. The very first held festival in Kaunas during 25th-28th October, 2018 invited to discuss the possible theater location, suitable environment, community involvement in the performance. The first year’s theme, which was partly inspired by „Kaunas 2022“ slogan „A gallery in each yard“ sounded as follows: „A theater at each home!“. After all, home is a very intimate, personal, ingenuous space and is the opposite of a scene, theater or a public place. The ingenuous real space collision with theater is a new, innovative theater genre not only in Kaunas, but also Lithuania. During its first years the festival settled in a house that is located at V. Putvinskio st. 5, in Kaunas. 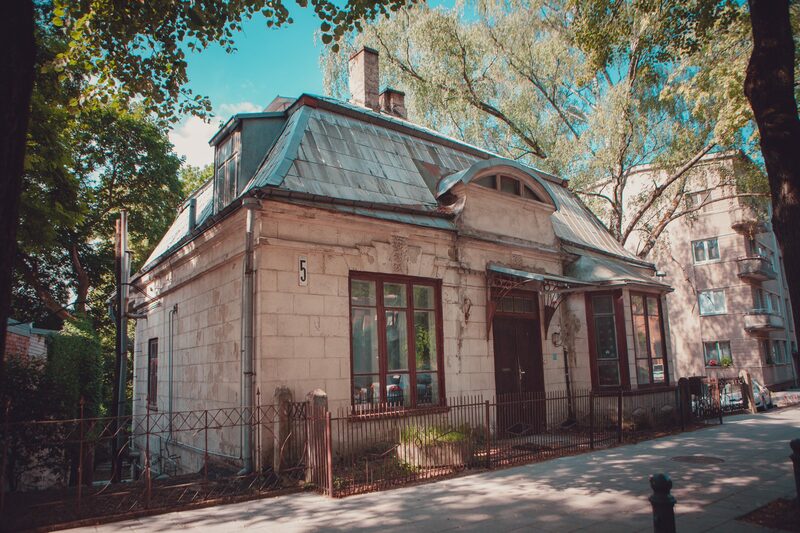 The location is rich with its history: living in this house was the famous Lithuanian painters Tarabildų family and today the house again has its new owners. 25th – 26th October. HoME … Work In Progress. Festival culmination – Czech Director’s Howar d Lotker, Czech troupe’s „Home“ and Lithuanian creators’ premiere „NaMIE … bėga gyvenimas“. It’s a unique story about the history of the house where the festival itself shall take place. Tomas’s, who helps the newborns to come to this world work has inspired the main motive of the performance – the journey through the nine most important and mysterious months of human life. This performance is a constantly changing journey that responds to the space and history of a particular building. In 2006 it was for the first time nominated as the „Project of the year“ in nomination „Příští vlna“/“New wave“ in the Czech Republic. This performance has received many critically acclaimed evaluations on the interaction of innovative content and form, as well as the rather unusual involvement of the viewer. 27th October. KALTŪNAS (directed by Saulė Norkutė). The performance for children audience „Kaltūnas“ – is a constantly adapting in new places multifunctional installation – a tour not only for the smallest, but also for the whole family. This is the story of a little girl named Gabėta and her magic hair, in which lays performances, creative excursions and interactive installations. 28th October. TENSE IN SENSE (directed by Karolina Žernytė). Theater lof Senses laboratory „Tense In Sense” theatrical experiment adapted specially for the V. Putvinskio st. home spaces and its history, taking into account not only the people but also the building’s past. The performance participants, who are blindfolded travel to the past and into the inner worlds of the house inhabitants while also travelling through time. Essential exploration directions in this project connect with the physical contact amongst the „actors“ and „spectators“. „Tense In Sense“ differs from previous K. Žernytė performances in the way that the viewers can move freely, come in contacts with other viewers and actors and explore the environment they create. The festival is financed by the Lithuanian Council for Culture and the Kaunas City Municipality.